Bathroom Anywhere is a wastewater transfer system from Thetford Corporation, a world-leading supplier of sanitation, refrigeration and other products to the home, RV, marine and heavy-duty truck markets since 1963. Since then, we have sold over 10 million toilets globally. Whether you’re looking for a basement toilet to flush up, something for a loft or even the garage, Bathroom Anywhere is the ideal solution! Thetford and its subsidiaries have designed, produced and sold more than 100,000 residential macerating toilet systems in the past decade. Thetford also manufactures RV gravity-feed toilets and RV/Marine macerating toilet systems. It has produced millions of two-piece, recreational portable toilets – and owned their Porta-Potti® name as a registered trademark – since the 1960s. 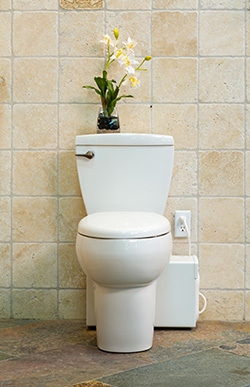 We are extremely proud of our macerating pump and up-flushing toilet systems, as well as our products’ ability to assist in hard-to-solve plumbing repairs. Based in Ann Arbor, Mich., Thetford is ISO 9001:2000 Certified and holds NSF/CSA Code Certifications. It is an accredited NSF Test Site. Please contact us with any questions and we’ll explain how our macerating toilet system can enhance your household or project. We have more than 50 years of experience at your disposal.